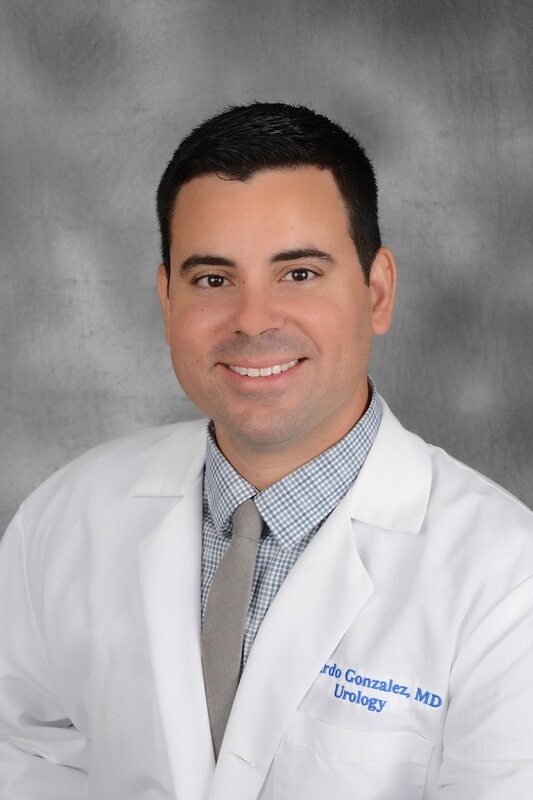 Dr. Ricardo Gonzalez, a native Floridian from Naples, is an experienced and knowledgeable urologist with expertise in conditions afflicting the adult urinary tract and genitalia. He obtained his medical degree from the University of Florida in Gainesville where he graduated with honors. He was then accepted to the prestigious urologic surgery program at the University of South Florida in Tampa Bay. During his urology residency he trained with surgeons at Moffitt Cancer Center, Tampa General Hospital, James A. Haley Veterans Hospital and with pediatric urologists at Nemours Children’s Hospital and Arnold Palmer Hospital for Children in Orlando. He has published numerous articles and a book chapter on urologic diseases including kidney stone disease and congenital anomalies of the kidney. He has expertise in kidney stone disease, urologic oncology (including prostate, kidney, bladder, ureteral, penile and testicular cancers), voiding dysfunction, overactive bladder, urinary leakage, urinary obstruction, prostate diseases, infertility, sexual dysfunction, erectile dysfunction and urinary tract infection. He is trained to operate utilizing the latest techniques in open surgery, robotic surgery and laparoscopy, as well as endoscopic technology. Dr. Ricardo Gonzalez has privileges at Lakewood Ranch Medical Center, Manatee Memorial Hospital and Blake Medical center. He is a member of the Manatee County Medical Society, Florida Urologic Society and the American Urologic Association. He speaks both English and Spanish.